If Mitch McConnell wins the Kentucky Republican primary Tuesday - polls suggest he leads - some will wonder if the tea party is losing influence. What it's really lost is the element of surprise. Has the tea party lost its clout in this year's midterms? 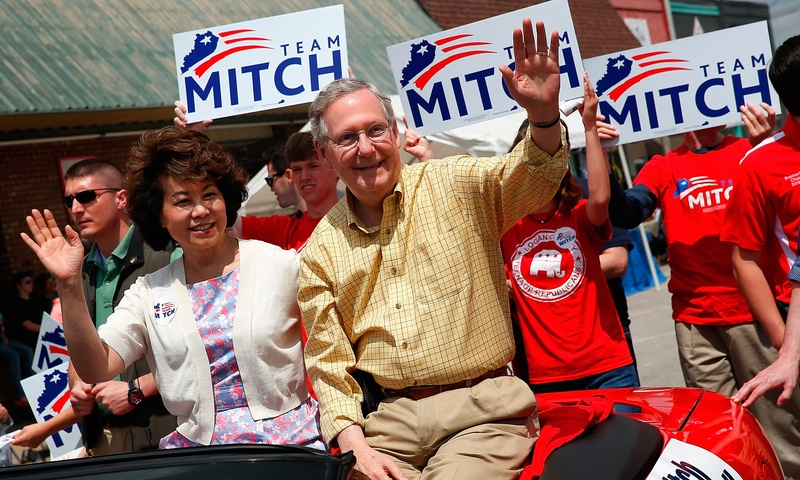 In 2010 and 2012, a lot of Republican incumbents and favorites didn't take on their tea party challenges early and they paid for it, but McConnell took no such chances this spring. He raised millions, mounted an aggressive campaign, and as a result goes into Tuesday night favored against tea party-backed businessman Matt Bevin. When McConnell, the sitting Senate minority leader, drew this challenge, the political world circled May 20 on the calendar as a big test, not just for incumbent Republicans but as a measure of the animosity toward Congress that Americans have voiced this year. And in that sense, McConnell is hardly done fighting to keep his job even if he does manage to win Tuesday night. The same anti-Washington sentiment that gave rise to this primary will also pervade the general election, and presumptive Democratic nominee, Kentucky Secretary of State Alison Lundergan Grimes, is hoping to use it against McConnell, too, come November. Polls have that potential matchup mostly neck and neck, even in this very red state and even in what figures to be a Republican-leaning year. So, if nothing else, watch Tuesday's primaries to familiarize yourself with Kentucky. You'll be hearing a lot about it for the next six months. As we watch the votes come in and want to see who's winning, are there key places we might expect McConnell or Bevin to do better? Primaries aren't easy to map from one year to the next, though one recent election offers at least an interesting comparison: before becoming the influential senator he is today, Rand Paul was himself the upstart here in a 2010 primary, running for the GOP nod against the establishment-backed (and Mitch McConnell-endorsed) Trey Grayson for the nomination. Paul ended up winning that primary fairly easily, 59-35 percent, notching perhaps the biggest tea party victory of that cycle. So, there aren't dramatic differences by county where Paul performed well or poorly in that 2010 primary, but it might teach us a little about a challenger vs. establishment matchup geographically. Paul did best in the relatively more-affluent suburban and outer counties around Louisville, Lexington and Bowling Green. He didn't do as well in the less-affluent coal mining counties of Eastern Kentucky (such as Leslie) as the map below shows. In fact, for 41 counties where the establishment-based Grayson averaged 38 percent of the vote, a little better than his statewide number, the average household income was just under $32,000; in 11 counties (excluding Louisville) where he averaged 29 percent of the vote, the income averaged $49,000. In 2010 the tea party-backed Paul tended to do better in counties that were a little larger and more marginally Republican in general elections, as opposed to smaller, overwhelmingly Republican counties. That said, we sometimes see the opposite in primaries, where one-party counties - in this case, heavily Republican counties - are deep enough party bastions that they sustain support for candidates representing multiple constituencies and challengers and establishment candidates run more evenly, while in counties with a tighter Republican-Democratic balance, the Republican voters might be less likely to divide their support between multiple candidates in a primary. We'll watch for which of those patterns, if either, emerges Tuesday night. The Republican-Democratic balance shows a lot of variation within the state, from Jefferson County (the city of Louisville), which has a 15.7-point Democratic tilt, to Leslie County, which favored Republicans by 26.4 points in the last general election. The more heavily Republican counties in general elections are those same eastern Kentucky counties where Paul didn't do as well. If we merge these two characteristics - partisan balance and income - and look at some counties that stand out, the map below shows those with the tightest partisan balance and relatively higher incomes and those with less affluence and simultaneously a more lopsided Republican dominance. In Georgia, a host of Republican candidates are bidding for the Senate nomination and is another state where some - particularly, Democrats - are hoping the recent past repeats itself, as Republicans worry, and Democrats hope, that a crowded primary competition pushes them too far to the right and puts the general election in doubt this November. This one isn't likely to be settled Tuesday night, but rather is likely to go to a runoff in July. There's some business groups vs. the tea party dynamic here too. Rep. Jack Kingston of Savannah, former Georgia Secretary of State Karen Handel, and businessman David Perdue appear to have the inside track for that runoff, while candidates further right have lagged in recent polls, but polling primaries - with their uncertain turnout - can be tricky and crowded fields mean even small percentage points matter, so here again, nothing is for sure. Waiting, once all is settled, is likely Democratic nominee Michelle Nunn, whose strong family name in the state (she's the daughter of former Sen. Sam Nunn) has Democrats hoping that, coupled with a drawn-out GOP primary, they can make an upset bid for this Republican-leaning state in November. It's especially challenging to compare past and present primaries with such a large and fragmented field. Still, we have a recent 2012 presidential race between Republicans Mitt Romney and Georgia native Newt Gingrich here to offer some data. Gingrich won easily, and some of his performance pattern is as much attributable to his local base as much as anything, but we might imagine that relatively-stronger Romney areas would be places the establishment GOP candidates will want to target Tuesday. Neurosurgeon and political newcomer Monica Wehby appeared to be the frontrunner against state Rep. Jason Conger, with some hopeful that if she could secure the nomination, her medical background, coupled with the difficulties faced by Oregon's health insurance exchange, could make for a competitive race in reliably-blue Oregon. From a vote-counting perspective, it's harder to say this primary goes down to the wire, as ballots are cast by mail and have been out for two weeks, so late-breaking campaigning may or may not play a role. And while the House doesn't look to be in play for November, there are a number of interesting House primaries to watch Tuesday. They include another proxy fight in Idaho's 2nd between incumbent GOP Rep. Mike Simpson, who has the backing of the establishment, but drew criticism from the fiscally conservative Club For Growth and a challenge from Bryan Smith. In Pennsylvania, some well-known names are in play, such as Marjorie Margolies - who once held a congressional seat but lost it in the Republican wave of 1994 after backing President Bill Clinton's budget. Margolies has since become Chelsea Clinton's mother-in-law, and the Clintons have lent their backing to the campaign. Anthony Salvanto, Ph.D is CBS News Director of Elections and Surveys. He oversees all polling across the nation, states and congressional races, and heads the CBS News Decision Desk that estimates outcomes on Election Nights. He is the author of "Where Did You Get This Number: A Pollster's Guide to Making Sense of the World," from Simon & Schuster, and appears regularly across all CBS News platforms. His scholarly research and writings cover topics on polling methodology, voting behavior, and sampling techniques.